This one is for all the recent graduates. Congratulations, it’s quite an accomplishment, what you did! We have our own grad in the family this year. My older daughter just completed four tough years at design school, and I wanted to make something very special to celebrate. I often get asked about making a raw cake. Not a cheesecake or tart, but a proper layered Cake, capital C and all. This was just the occasion to tackle that. Daisies have been blooming everywhere recently. Their yellow, festive middles, surrounded by a crown of delicate white petals always put the biggest smile on my face. 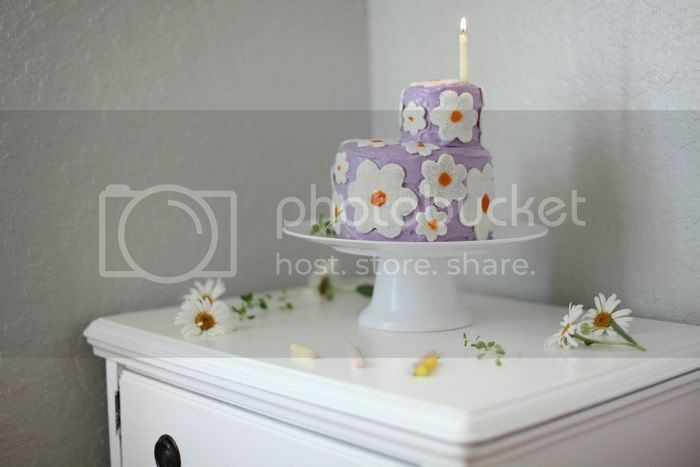 I got the idea to use the daisy as a decorative element for the cake, as a symbol of spring and the newest of beginnings. We’ve got five berry-filled layers of the gentlest texture, cloud-like and airy on your tongue. Then the whole blueberries interject with bursts of cooling freshness. Paloma was completely enamored with the coconut daisies when I was making them, following along with the whole process, eager to have a taste. Lately, she has been taking much interest in the kitchen, and of course that warms my heart. Paloma made her own mini daisy cake and ate it, too. Recently, we had the honor of contributing a recipe to a sweet little cookbook called Frugally Delicious. The book focuses on delicious cooking on a budget and is full of tasty recipes from many wonderful blogger contributors. It is honest, beautiful in its simplicity, and full of variety in the recipe index. Hop over to the book’s site to learn more. We are giving away one copy of Frugally Delicious. Simply leave a comment to this post between now and Sunday, June 17th at 12pm EST to enter the giveaway. In a food processor, blend the chopped dates into a paste, add little bit of water if needed. Don’t worry if the paste is not completely smooth. Add coconut oil, vanilla, and salt. Continue mixing. Add the almond pulp, blueberries, lemon juice, and mix well to incorporate. Do it in two batches, if your food processor can’t handle the whole amount. You should end up with soft and light to touch cake batter. If your almond pulp is too wet, add a little more of it to your batter. If too dry, add some blueberries, or a splash of almond milk. In a high speed blender, combine all the ingredients with the exception of blueberry powder, coconut oil, and blueberries until very smooth. If using, start adding the blueberry powder, to achieve the desired shade of purple. You can also use fresh blueberries to add taste and colour instead. Add the coconut oil at the end to emulsify. Reserve about 2 1/2 cups of for frosting the cake. Transfer the rest to a bowl and mix in the fresh blueberries. Separate the cake batter into four parts – three even ones and one for the small second level of the cake. If using a springform, lightly grease it with coconut oil. If using a cake pan without a removable bottom, line it with plastic or cake wrap. Spread one portion in the bottom of the pan in an even, flat layer. 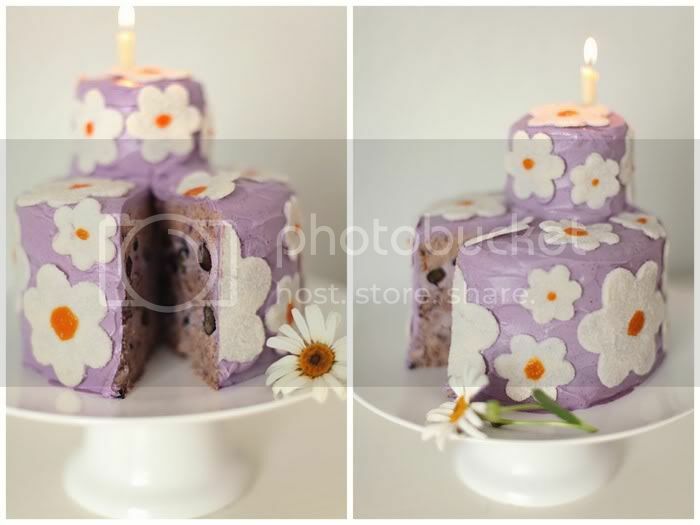 Top with a thick layer of frosting with the fresh blueberries. Put in the freezer for 1-2 hours, or until the cream is firm. Spread another layer of cake batter on top of the cream, following with the second layer of cream. Freeze for another 1-2 hours and finish with the last layer of cake batter. Put the cake in the freezer for 30 minutes before removing from the pan. For the small second level, repeat the same steps, with only one frosting layer in between two layers of batter. Frost the large cake first with the reserved frosting. Arrange the small cake on top and frost it. 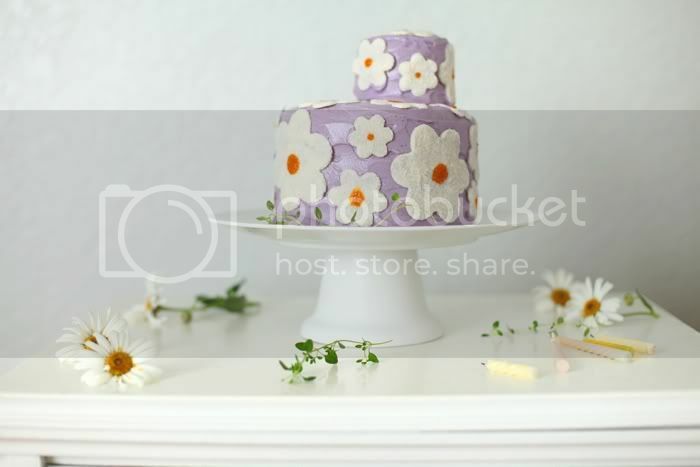 Arrange the daisies on top of the frosting. Keep refrigerated. These flowers were made by blending the meat of a young Thai coconut with a small amount of coconut water in a high speed blender. I didn’t measure the precise amounts, just eyeballed them. Then, I added dried shredded coconut and some agave and blended until I achieved a smooth, thick mixture. Then spread the mixture on Teflex-covered dehydrator trays, dried for an hour or until the surface became dry and I could cut out the flowers with a cookie cutter. After cutting, I left them in the dehydrator for another couple hours, until completely dry and easily separated. Towards the end of the dehydration time, I squeezed some fresh mango puree in the center of each flower, using a piping bag. I just love that Paloma made her own cake! And it is cute, too! I need that cake in my life right now. That is the absolute most beautiful cake Ive ever seen. Im def. going to have to make one :) Thank you!!! I am completely in love with your blog! As I venture into my humble blogging adventure and dream of hosting organic, whole food, raw dinners for my friends, or creating cooking classes or retreats focused around real foods, I find myself so inspired and intrigued by what you do. I would love to find out more. Do you do this for fun, or is this your job? Do you cater? Either way, each post amazes me by it’s esthetics, and this one is no exception. 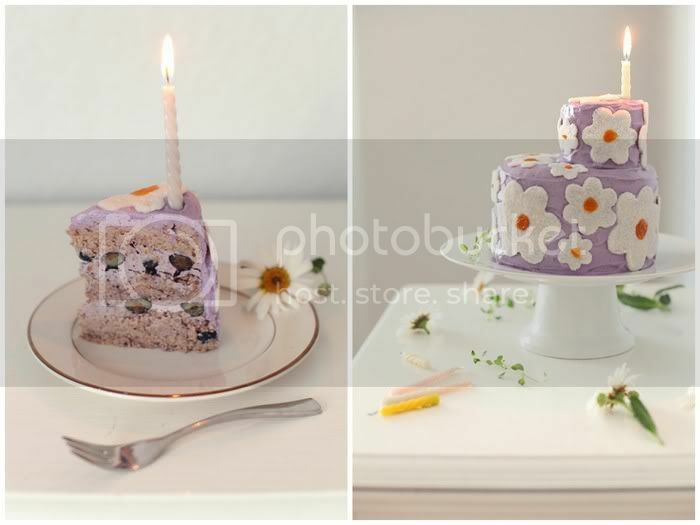 Absolutely beautiful and appetizing cake! Wow, so beautiful and simple. I love your recipes and how creative they all are! This cake is now on my to do list — it looks SO yummy. Thanks for the chance on the cookbook, too. You did an absolute brilliant job!!! I was fortunate to try this cake!!! Heavenly tasty! Gorgeous! And Super Healthy!!! Thank you Anya for sharing your endless talent with us!!! OMGsh! This not only is beautiful but looks delicious! Your food pictures are absolute eye candy. Bet it tastes as wonderful as it looks. Awesome colors and the ingredients sound very intriguing. Paloma looks as cute as ever! ohgoodgolly that is the most squealingly delightful cake! I think it would be perfect for Fourth of July too, with little red/white/blue rockets instead of flowers. Thank you for sharing! i discovered your blog recently and have been enjoying it a lot. what an awesome cake! thanks for the inspiration! Exactly what I was looking for! Love love love this. Will go well next to the chocolate persimmon tart! how gorgeous!! that is such a beautiful cake! thanks for sharing! You’ve got to be kidding me… How? HOW, I say, do you keep coming up with these beautiful creations??? You are a food genius! Golubka, That cake is fabulous! I cant wait to try it! I have made many a raw torte and cheesecake, but am ready to try the almond based creations! Thank you! I would love to win that lovely little book! I am soooo making this tomorrow!! Simply beautiful :-) Thank you! It’s such a romantical cake, I love the fact it seems to come from a bakery/pâtisserie while it’s actually raw and healthy. Oh this looks tasty. But I’ll definitely try to make the recipe for the chocolate-raspberry dessert you once posted! The cake is so cute! And I love your blog, it’s so inspiring! The cake is beautiful. I would also love the book. Thanks for the giveaway. WOW ! so beautiful and so very tempting!!! What a beautiful cake for a great occasion! Congratulations to your older daughter. This is amazing! I’m completely astounded that it stays up like that without baking. How long would it keep for? The recipe sounds delicious and the cake is gorgeous! Congrats to your daughter! What a great recipe! And the cake is gorgeous. This is beautifully done. Congratulations to your daughter, and a big thank you for always taking the time to post my translations! I am really curious about that book, and I would love see how it is, it sounds like a great idea… Haven’t you ever thought of trying to publish your own raw cookbook? Once again a stunning piece of edible art. You are an inspiration in our house. That is the cutest cake ever! I love how you placed the upper tier to the side instead of the traditional middle of the bottom tier…your pictures and articles feed my creativity, thank you! 1 – I can’t believe those flower decorations made with coconut. Beautiful and very clever! 2 – The cookbook looks beautiful. I love the hand drawings on the cover! I checked out the list of contributors, and the only blogs I already follow are yours and Sprouted Kitchen. I’ll have to check out some of the others now! Beautiful cake, very unique colors! A raw cake! This blows my mind!!! SO awesome. This is incredible! Thank you for always being so inspirational!! I am really surprised by how “easy” this seems. All obtainable ingredients, and I do believe a disastrous unbaker like myself could possibly pull this off. Absolutely beautiful, as always. Congrats to your daughter. And please allow me to reiterate the fact that your blog is AMAZING!!! What a gorgeous cake and I love ur little ones cake so cute.U are truly artistic..
Oh my gosh! How breathtaking is that cake! And it looks delicious to boot! I don’t know how I’ve never found your blog until now, but I am so glad I did. You are amazing! Wow! this looks delicious, I will have to try this recipe along with others. I need to order this cookbook as well. Thanks for sharing. You are an artist, not a cook! Wow. What an impressive cake. My blueberries are starting to ripen in the garden, so I will have to give this a try. Thanks. This looks amazing and sounds so do-able! Thank you for your inspiration! I can’t wait to try this recipe. I love all your posts and gorgeous photos. Thanks so much for the inspiration and eye candy!! HOLY HEAVEN!!! This will be the cake of the party this coming weekend! Daisy is the name of a rescued dog in Bali who never until now has seen the outside of a cage in her four years of life. Daisy, this one is for you! For love, life and health! Thank you Russian Doves for your beautiful and (most importantly!) healthy inspiration! Wow! What a stunningly beautiful cake! Thank you so much for sharing! Those daisies are so adorable! Such a beautiful cake! super cute and now I am hungry! You do amazing things with raw food! I love your pictures and what you come up with! I was just introduced to your blog- and I have to say I am absolutely thrilled!! Darling cake- I will be trying it and many other recipes very soon! Thank you for sharing your gift!! I definitely want to make this recipe, I’m always looking for ideas to use almond or nut pulp. Love your blog! Alexine, your ideas sound amazing! Food blogging is not my day job, although I would love for it to be :) I don’t cater, but sometimes host small gatherings or cook for friends’ events. Celia, thank you, that’s amazing to hear! Joanna, you’re too sweet, thank you! SneakyLemon, we kept it for about five days and it held up pretty well. Nancy, this would be amazing with your OWN blueberries, wow! Charlotte, that’s great to hear! Alejandra, thanks for your comment. And best of luck with your cake business! whow this looks amazing, why am i not supriced? its like finding a little treasure in my e-mail box every time you have posted something and can’t wait to make it. I will make this one for my little sister who has had a rough time it will make both of us smile!!! thank you so much, your beautifull recipes brought tears to my eyes today, please don’t ever stop!! As wonderful as your cake looks, I think I like Paloma’s better. Apparently you’ve got another designer in the family. What a breathtakingly gorgeous cake! Wow! It’s too bad I’m late for your giveaway. Nonetheless, this cake is unbelievable. This book sounds interesting and the cake looks so tempting. Congratulations to your daughter! Love the cake. Oh, yum! I nearly licked my computer screen! I love your blog, so many inspiring ideas! 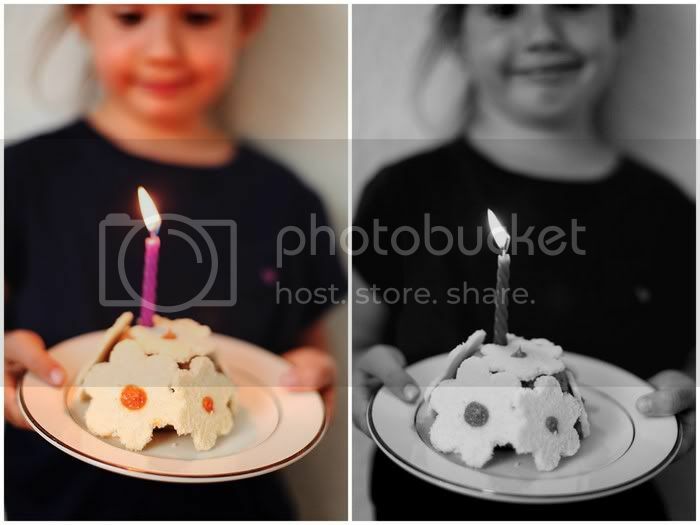 i was inspired by this one in particular and modified it to make a non-raw almond cake in the oven for a Birthday. I used blanched almod flower that i had on hand instead of the almond milk leftovers and added soaked chia and baking soda. it turned out great!! its being devoured as i type. Thanks for the inspiration!